An astrologer with over 30 years experience in astrological practice and social services, Steven is now studying for his PhD and a diploma in Mediæval Astrology. He tells us he has resided in Africa, Asia, East and Western Europe. In this, the third part of this fascinating series, Steven Birchfield, astrologer and philosopher, continues his exploration of Hellenistic Astrology, the underlying basis of our system. Here he examines the ideas of Signs, or "zoidia" not only having a sense of "sight", but losing it and having to employ "hearing" and "touch". 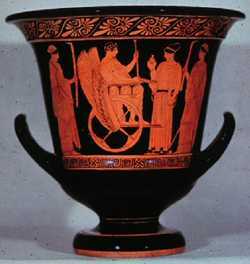 He looks at the concepts of Aversion and Mitigation, Scia and Antscia, powerful tools in the hellenistic astrologer's toolkit, that can be usefully employed even today. The 'figure description of its ruler' is simply whether or not the zoidion, where the ruler is posited, can or cannot 'see' the ruler's domicile. This infers that it's not necessary for the lord of the zoidion to be in his domicile for the sign to effectively function, but in order to be 'operative' he must see it. The zoidion [and thus the 'house' or 'affairs of life' which were the responsibility of that zoidion] became dysfunctional and adverse when the 'lord' could not see it. This was a serious situation, as "the stars found in these zoidia [in aversion] became inharmonious. And sometimes they bring about hostile conditions, sometimes separations and banishments." If the ruler of the 10th was in aversion to it, then it would be very difficult to find a 'harmonious' integration of one's actions in regards to one's career for example. History is replete with examples of people with serious impediments and dysfunctions who, in spite of their handicap, have made considerable contributions to society and mankind in general. The dysfunction, where overcome, was made an incredible strength. And likewise we find its parallel within the relationships of the zodia. In astrology, as in life, zoidia in aversion could overcome an aversion through the use of other 'senses'. There are then four conditions of the zoidia that mitigate aversion and we can well liken them to the conditions that exist when we are physically blind. I hope all you women can appreciate the significance of this arrangement between the Sun and Moon! Ibn-Ezra certainly did, "as they are both rulers, the domiciles are considered as belonging to one ruler". Not only are these two signs not in aversion, but also the lord and lady [Sun and Moon] is one and the same ruler. In fact here we may have full equal rights. The Moon is fully familiar with Leo, just as the Sun is fully familiar with Cancer. There was a mutual respect, as if they were one ruler! If we continue this logic to its natural conclusion, it's difficult to say then that the Sun is without dignity in Cancer and just as difficult to say the Moon is without dignity in Leo, as these zoidia were seen as having one ruler, a joint rulership. I'm not going to go into it here but this does raise some interesting insights into how sect should function. Both Schmidt and Greenbaum have translated this relationship as 'like-engirdling' and the like-engirding zoidia are: Leo and Cancer because of the Sun and Moon, Gemini and Virgo have Mercury representing them, Taurus and Libra whom Venus represents, Aries and Scorpio with Mars representing them, Sagittarius and Pisces because of Jupiter and Capricorn and Aquarius because Saturn represents them. Before I go into just how these relationships are advantageous, I'd like to finish presenting all of the various conditions that could mitigate an aversion. The next relationship we meet is one with which many who deal with horary questions are familiar. 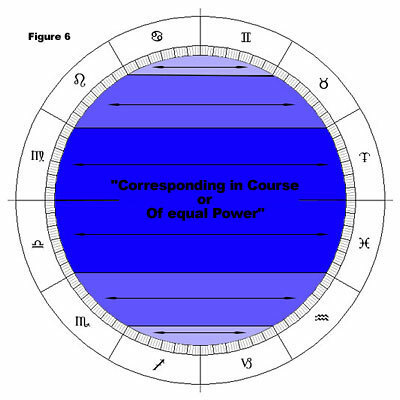 That is zoidia that are "Corresponding in Course" or "Of Equal Power" [Figure 6]. In other words, these are signs that are equidistant from the solstice points 0° Cancer and 0° Capricorn, and relate to the length of time during which a degree (or moira ) of the zodiac is above or below the horizon. This is of course relating to antiscia. Antiscia are points or degrees symmetrical to the solstice points. In the Northern hemisphere 0° Cancer is above the horizon for the greatest amount of time each day while 0° Capricorn is above the horizon the least amount of time. This reverses in the Southern hemisphere. In either hemisphere 1° Gemini and 29° Cancer are 29° from 0° Cancer just as 29° Gemini and 1° Cancer are both 1° from 0° Cancer. They have corresponding inverse degrees and so have equal light as they spend the same amount of time above (or below) the horizon. The signs that have equal light are Gemini and Cancer (in aversion), Taurus and Leo, Aries and Virgo (in aversion), Pisces and Libra (in aversion), Aquarius and Scorpio, Capricorn and Sagittarius (in aversion). "Six of these signs are direct in rising; these are from the beginning of Cancer to the end of Sagittarius. Six are oblique in rising; these are from the beginning of Capricorn to the end of Gemini...Two signs indicate agreement and friendship, for example Gemini and Cancer, Taurus and Leo and the others like these. Those agreeing in the length of daylight are said to be powerful agreeing in power." The last two conditions are related, and contain a familiarity between the same zoidia. These zoidia are of equal ascension and they are likewise equidistant from the equinoctial points of 0° Aries and 0° Libra. The latter was referred to as "equipollent". [Figure 7] The equally rising zoidia and equipollent zoidia are Aries and Pisces (in aversion), Taurus and Aquarius, Gemini and Capricorn (in aversion), Cancer and Sagittarius (in aversion), Leo and Scorpio, Virgo and Libra (in aversion). In this particular familiarity between the signs we also find the aspect of 'hearing'. As mentioned by the earlier authors, one sign 'commands' and one sign 'obeys' based on 'temporal signs' [summer signs] and 'crooked signs' [winter signs]. While these signs cannot 'see' one another they sense one another and are familiar with one another through what I would compare to a sense of 'touch'. Likewise these same zoidia also possess a sense of hearing. Although Ptolemy did not include zoidia which were 'like-engirdling' many other authors did, and his statement is nonetheless valid. Being 'familiar' was not just aspectual, as we have seen; it was also based on other astronomical association, whether of equal ascension, equal diurnal hours or where diurnal hours were equal to nocturnal etc. We have in our Zodiac 24 pairs of inconjunct zoidia and through 'familiarity' 12 of them are mitigated. Following is a table that lists these. Paulus in his Introductory Matters, gives us some insight into just how this mitigation works. While Paulus does not explicitly list the antiscia zoidia, other later authors certainly do, but Paulus nevertheless does leave us with the feeling that these two are not the only such configurations, as he ends this chapter by saying "or other similar configurations". Paulus tells us that "And those neighbouring to themselves have sympathy for one another just as if they were placed in the same domicile". That is, they are similar to a conjunction. You may feel some confusion in his next statement however when he says, "while those zoidia 6, 8, or 12 intervals away have power just as if they were in diametrical position". This may seem that it doesn't make sense. If you consider Pisces, for example, has Aries (2), Leo (6), Libra (8) and Aquarius (12) in aversion to itself. The aversion with Aries is mitigated because they are equally-ascending and the aversion with Libra is mitigated because they are of equal-light (antiscia). So by his explanation, a planet in Pisces should be "as if they were placed in the same domicile" [or conjunct] with another placed in Aries. Libra being in the 8th position from Pisces would "have power just as if they were in diametrical position" or behave as if in opposition. These are so far clear, but the confusion arises if you consider Aries has these zoidia in aversion to it: Taurus (2), Virgo (6), Scorpio (8) and Pisces (12). 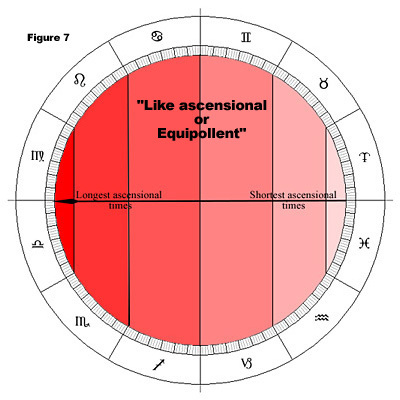 The aversion with Virgo is mitigated because they have equal-light; with Scorpio because they have the same ruler, Mars, and are like-engirdling. These two according to Paulus should have the power of the opposition. What about Pisces? His list says it should be like an opposition. There appears to be some ambiguity here. I say this because he clearly states "those [plural, like Aries/Pisces] neighbouring to themselves [plural] have sympathy for one another just as if they [the plural again] were placed in the same domicile." and again at the end of his chapter he re-affirms this by saying, "The equally ascending Zoidia which are adjacent to each other, likewise will exert the same power on each other." This is specifically talking about Aries and Pisces or Libra and Virgo, "or similar configurations." So it is perhaps difficult to see the consistency of logic in being in conjunct on one side but opposition on the other. The only way this arrangement can make sense is that Paulus also in the same chapter says, "the power being more for those averse zoidia, which are like-engirdling and equally ascending, which come to be active this way by position on the right". In other words, the relation is more powerful from Pisces to Aries (Pisces being on the right of Aries) than Aries to Pisces (Aries being on the left of Pisces). That is to say a sinister aspect, one that looks forward in the order of the zodiac, is more powerful than one that looks back, or is dexter. This is consistent with the Greek concept of 'seeing' and 'perceiving', but is the opposite of medieval tradition, which considered the dexter as superior to the sinister. But it's important to remember that here we are talking about aspects from zoidia and not planets. The medieval tradition lays more significance to the aspects of the planets than those of the zoidia. In both Hellenistic and later traditions, it was more propitious for Saturn, Jupiter and Mars to be oriental of the Sun. The Sun would then be casting its rays against the order of the zodiac in dexter aspect to these slower planets (a lighter planet always aspects a heavier or slower one). 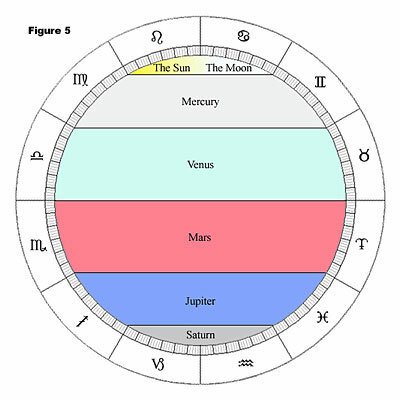 Likewise it was better for Mercury and Venus to be occidental of the Sun, because, since they were lighter, they would cast their rays against the order of the zodiac, or in dexter aspect to the Sun. So it is a significant point to notice that the activity of the zoidia was not quite the same as that of the planets. This is the end of part three of The Living Signs. Read the next chapter of The Living Signs. Bk I ch.2 — "The Anthology" of Vettius Valens, Translated by Robert Schmidt and published by Golden Hind Press. They are the presiding "sect" rulers. — S.B.